Embodying a title which denotes prosperity, actor and screenplay writer turned film director Sanjaya Leelaratne's debut movie Selvam will hit the CEL circuit cinemas from November 25. Shot entirely in Jaffna after the three-decade terrorist era Selvam unites the Sinhala, Tamil, Muslim and Burgher clans together in one reel. Produced by M Mohamed, the story revolves around a selfless hero who strives to nurture harmony among the civilians after the three decade conflict. It highlights the heroism of the forces and projects the true situation of the north where Tamils and Sinhala people are able to communicate and get along hand in hand. Q: Selvam focuses a lot on the government and especially on President Mahinda Rajapaksa's role in post terrorism. Some have even said that the film is a pro government campaign. A: We made the film without political agendas or aimed at any precise groups. The story unfurls within reality. Much like a documentary Selvam portrays the true situation of the north. The government has a hand in all the events that are taking place after the elimination of terrorism. I will not be able to focus on these incidents without mentioning this fact. I have not highlighted development plans like road constructions and transportation. My topic was on the change of peoples' attitudes which we witnessed during shooting. The elections too were held in the north after many decades. That is an important aspect in the country's history and the poster in the closing scene was inserted to signify that idea. Schools have opened doors and children can once again engage in their studies without fear of being killed on the way or kidnapped by the LTTE. Youths get a chance to carry on with their life and communicate with their peers. They can find partners and carry on with life unlike in the past when they were forced to join the LTTE at the age of 15. Just because I portray these ongoing incidents they say I have campaigned for the government. Would I be campaigning for King Rajasinghe if I made a historic film based on his period? Q: The film also deals with the hero concept. A: We all have heroes from our childhood. It changes with time. Personalities like Che Guevara, Carl Lewis and Usain Bolt have a large fan following. Selvam gets to know that the LTTE had killed his parents and it is natural that he feels gratitude towards whoever that eliminated the movement which destroyed his family. In this case it is President Rajapaksa who had spearheaded the event. Therefore he becomes Selvam's hero. Likewise a member of the opposition can be another's hero. It differs from person to person according to their personality and needs. Q: Why did you give the movie a Tamil name? A: Selvam means prosperity in Tamil. We chose the name because we felt that the country is gradually entering a prosperous era. Selvam also happens to be a name and we used that for our main character to enhance this nation. We have also incorporated prosperity to the song. We planned the visuals at length because that was our best means of driving home the message. Many people asked me why I decided on a Tamil name for the movie. Our concept cannot be branded as Sinhala or Tamil so why should I give a second thought trying to find a Sinhala title for my film? Q: You are an actor, a screenplay writer and a teledrama director. How would you describe your experience in directing a film? A: I have written the screenplay for a lot of financially successful films. Many of those directors invited me to make a film. However I was not in the right mindset to take on the challenge. I took my time and finally when terrorism ended I was inspired to make a film about life getting back to normal in Jaffna. The army had done its duty and now it is our turn to take up our responsibilities. One is to make sure that terrorism will not be able to lift its head again in this country. I can contribute to this concept through my field by lacing love and understanding among the ethnic groups. I faced many challenges in the film. Joe Abeywickrama was blind at that stage but he acted in the movie. I flew him to Jaffna on a plane, conducted shooting and returned him back to his home. It was costly but he fitted the role of Sathyavelu's grandfather. Shalini Tharaka had acted in teledramas but she was not used to acting for a film. In such instances stage and teledrama actors overact. Their slightest movement is detected and shown on a broad scale on the wide screen. Therefore they need to learn to tone down their movements. Q: Selvam has introduced two new faces to cinema. A: Directing Shanthalingam Gokulam, an ex-LTTE soldier, was very challenging. 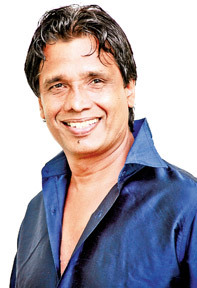 He portrayed Pushparaja's role opposite Shalini Tharaka. He had been fighting for the LTTE for eight years and had been in the rehabilitation camp when we found him. I found it difficult to direct him because he had not acted or danced in front of a camera. We did not have a choreographer for the film so I had to conduct the dance sequences. The LTTE had painted a different picture of the Sinhala people to youths like Gokulam. He had only been with the LTTE and army and met Sinhala civilians only after he was chosen for the film. As we began shooting he realized that the Sinhala people welcome him as a member of their clan. He couls well be the first terrorist in the world to turn actor. The child who acted as Selvam is Danny Abhinesh. We chose him out of about 240 children who came for interviews. Q: You have commented that the Jaffna citizens were very supportive to you and the team. Care to share some of your experiences? A: Our shooting was mostly done in Valvattithurai which is LTTE leader Prabhakaran's village. We also shot a couple of scenes in Prabakaran's school. We were unsure whether there will be problems from the people but the villagers were friendly. They treated us to homemade delicacies like dosai and vadei. They lent us their homes and shops for shooting a moved away for a couple of days. Some even refused the money that we tried to give them for lending us their property. They enjoyed watching us shoot the film. They were relieved that terrorism is over because they suffered immensely during that period. They did all this because they love their new found freedom. Q: The film won an award at the UDC Business Awards 2011 in Malaysia. A: The award is given to a director for his debut film. We sent applications, DVDs, a synopsis of the film, details about the locations and a profile about Gokulam. They were pleased with our concept and gave us the award. The credit goes to our whole team because the cast and crew were the backbone of the project. The award is a good example of the international public's acceptance of what had been projected in the film: people living in harmony in the north, the elimination of terrorism and the forces being made up of disciplined and well mannered individuals. Q: Post war there has been a cluster of patriotic films. In this light why do you think the audience should watch Selvam? A: A lot of films were based on the terrorist and post terrorist situation of the country. War and conflict are global issues. Our film is not about the conflict though we talk about it at various stages. We do not show the army or LTTE shooting in the battlefront. We project the lifestyle of the north as it is today. National harmony is our main theme. We link the north and south with elders' blessings. This is what should happen in the future and if this is practiced there will not be attempts to revive conflicts among ethnic groups within the country. Q: Do you hope to continue with film directing? A: Certainly. I will begin shooting for my second film in January. It is based on Sri Lankan women. It pinpoints the trials that a girl faces from birth to death. She is bound by social norms and traditions and if she tries to break free, the society degrades her position. I wish to make a movie which earns respect for women. The film deals with the idea that a small group of wealthy people control most of the time, which is the only currency, and the remaining 99 percent are left to share what is left. Justin Timberlake was a star at such a young age that money started rolling in relatively early for him. So playing Will Salas would have him tap into what it's like to not to be himself. In Time marks the first real starring role for him as an action star. "It's like boyhood fantasies lived out: To shoot guns and kiss the girl and beat the bad guys. And you get to do it where Colleen Atwood puts a suit on you. You get to drive a Jaguar. You know I told Andrew the future looks surprisingly retro in his mind. I kind of dig that about it. My favorite sci-fi movies are the ones where everything is not that far off from, aesthetically, not that far off from where it is today. But kind of has it's own uniqueness to it. I really like that about this movie as well," Timberlake opined about his transition from a comedy and romantic movie artiste to an action hero. Queried on what sort of similarities he finds between himself and his character - Will he said, "There are so many. This is the first time that I've felt like it was the most personal. Everything that happens to Will is so tangible, even though this is such an otherworldly concept. Those basic feelings of revenge and contempt and wanting to change the system I think is something that everyone can relate to, I think. I know I could." 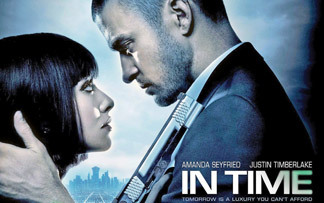 In Time is screening at Savoy cinema, Welawatta. The 40-year-old director Imtiaz Ali thought back to his college days when coming up with the story for his new film Rockstar. "All of us have seen these wannabe musicians, guys who play guitar and want to be a westernised rock star," he says. "I've hung around many of these guys while in college." 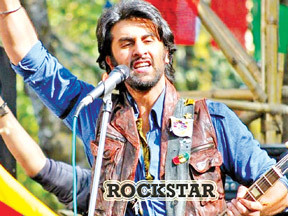 Starring Ranbir Kapoor and the model Nargis Fakhri in her big-screen debut, Rockstar tells the tale of a middle-class boy named Janardan whose efforts to become a musician are met with laughter. He then realises that all big musicians have some tragedy or heart-break in their lives and so he sets about creating his own. He decides that he needs the school diva Heer Kaul to break his heart and sets about attempting to woo her. To prepare for the role, Kapoor took guitar lessons from the film's composer, the music legend - and the Slumdog Millionaire composer - AR Rahman. As for Kapoor, the 29-year-old actor was adamant that his take on a musician would not be completely westernised. "In India we don't have a rock-star character, my character is not influenced by Kurt Cobain or Jim Morrison," he says. "It's more about the character's journey that spans seven years and the influence that he has. Even the soundtrack is not particularly all rock album songs from different genres, the title Rockstar is important to the film, but he's not that leather jacket-wearing, guitar-breaking cool guy that we are all exposed to. It's another take." Rockstar is also noteworthy for featuring the final appearance of Kapoor's great uncle, the acting legend Shammi Kapoor. The actor and director pleaded with the man called the "Desi Elvis Presley" to come out of retirement. "I feel happy he did a movie before he went," says Ali. "He had not worked in 10 years, he is an actor, his soul is that of an actor, he did all the good things and bad things that an actor does. But he had a lot of health issues and I feel happy that all of us contributed to making him work again one final time, before he went away." She has a passion for the arts. This drove her into taking up aesthetic subjects at an early age and dedicating herself to various projects, some which have seen the light of day while others which are queuing to be shown on screen. Clad in earthly shades and donning the role of a village lass with ease Nadeeka Alahakoon can be spotted among the cast in Senior Prof Sunil Ariyaratne's latest movie Kusa Paba. Born in Ruwanwella and a student of Ruwanwella Central College Nadeeka had later moved to Pilimathalawa, Kandy for higher studies. She is studying for her external degree in the arts stream at Peradeniya University and following the Higher National English Diploma at the Sri Lanka Technical College. Dancing is her inborn talent. She had won many awards for dancing during her school days. She had excelled in dancing techniques at the Career and Educational Institute. .
"I would love to develop my aesthetic skills and take part in more productions. My greatest loves are acting and dancing. It is a blessing to take part in Kusa Paba. It unveiled many new aspects on the subject to me," she noted about her experiences on the sets. Kusa Paba is not her debut film. She had taken part in another historic movie, Sanath Abeysekara's Mahindagamanaya. This time too she is acting in a supporting role which she believes helped her to mould her acting talents. "I would love to take part in quality productions but my main aim is to become an English teacher. I am also into compeering and wish to engage in that as a part time career," Nadeeka said adding that she also pens poems and short stories as a hobby.